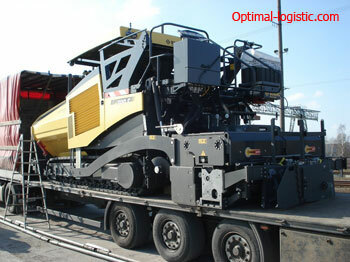 If you need the transportation of an asphalt paver, please contact us. Optimal Logistic Company will easily transport any heavy loads across Ukraine, Europe and Central Asia. We are engaged in cargo transportation for a long time, we guarantee 100% quality of the services provided. Our company is the leader in this field . ; Therefore, you can be sure that the transport of the paver will be carried out, adhering to all the rules of transportation of this kind of equipment. unload upon arrival at the destination. Organization of delivery of oversized cargo in Ukraine, as well as in other countries will be made promptly and accurately at the appointed time. You pay only one way. Photos of the workflow are placed in the corresponding section. Calculation of the cost of transportation services for the paver is available here by clicking the appropriate button and filling out the form. You will quickly call back to discuss the nuances. The cost depends on the dimensions of the asphalt paver and the route of delivery. We guarantee that we will provide you with better conditions and you contact us again.